One of gaming's biggest series almost never made it off the ground. These days, Rockstar's Grand Theft Auto series is easily one of gaming's most prominent landmarks. But things could have been very different, once upon a time - the first GTA was at one point in such bad shape that the publisher wanted to can the project entirely, says one of the original designers. 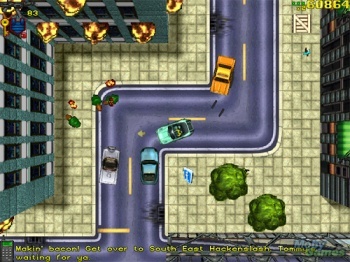 "[The original GTA] was a real mess for years, it never moved on, it never went anywhere," Gary Penn - who worked on the 1997 title (1998 in North America) while at DMA Design - told Gamasutra. "It was almost canned. The publisher, BMG Interactive, wanted to can it, as it didn't seem to be going anywhere." Development was hampered by bugs and crashes, said Penn, which meant it difficult to test any features the team actually implemented. "There are probably two key things it fell down on. Two critical things. One of them is stability, which is a really boring one but it crashed all the f*cking time. So even if you did get something in the game, you couldn't really test it." Given that the core of GTA involved driving cars, you would hope that the game's vehicle mechanics would work well - but that was the other problem, said Penn. "[The] other thing that was a problem was the handling - the car handling was appalling ... the core of playing was fundamentally broken." Ah, so it played more like GTA4 then? However, one of these bugs ended up being a good thing. One day in testing, the game's police suddenly became uber-aggressive thanks to poor pathfinding - they would try to drive through the player. "That was an awesome moment because suddenly the real drama where, 'Oh my God, the police are psycho - they're trying to ram me off the road' ... that was awesome, so that stayed in." Just think about it: If the first GTA had never been released, we would never have seen GTA3, one of the most influential games of the last ten years. Rockstar would never have risen to power. The Escapist's Game of the Year might have been Mass Effect 2, StarCraft 2, or Kirby's Epic Yarn.